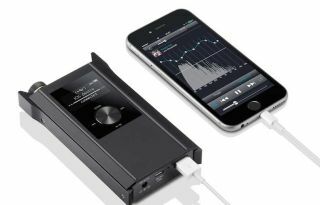 Onkyo DAC/headphone amp enables high-res playback from iOS and Android devices | What Hi-Fi? Splash out £499 on an Onkyo DAC-HA300 and you can add 24-bit/192kHz and DSD audio capability to your iOS or Android portable. If you have an iPhone or Android smartphone or tablet and want to add high-resolution audio capability, Onkyo's new DAC-HA300 digital-to-analogue converter/headphone amp can oblige. It connects via USB to an iPhone or Android handset (using an Apple Lightning connector or Android On-the-Go cable) and then syncs with Onkyo's HF Player app. A free upgrade to the HD Player Pack app enables output of high-res PCM (Pulse Code Modulation) or 5.6MHz DSD audio files to the DAC-HA300 for decoding and playback. In addition, the DAC-HA300 serves as a standalone media player and headphone amp. It has a slot to accommodate up to 128GB of music on a microSD card, and is equipped with a micro USB Type-B input for asynchronous digital-to-analogue conversion of high-res audio from a PC without the need to install drivers. It also has a switchable optical/coaxial/analogue input capable of accepting digital signals from connected devices up to a maximum resolution of 24-bit/192kHz. Onkyo says the DAC-HA300 uses a MUSES8920 op-amp, a fully discrete push-pull output stage and a selectable gain adjustment function. Its 32-bit/192kHz TI Burr-Brown PCM1795 DAC was chosen for its "low out-of-band noise performance and excellent resistance to jitter". The unit is powered by an internal lithium-ion battery which gives around seven hours of playback when connected to an iPhone, and can be recharged via USB when connected to a PC or using the supplied 5V DC cable and plug. Constructed from durable aluminium, the Onkyo DAC-HA300 will be available in black for £499 from the end of April 2015.